The fatigue calculation according to ASME 2013 Sec. VIII Div.2 Part 5. 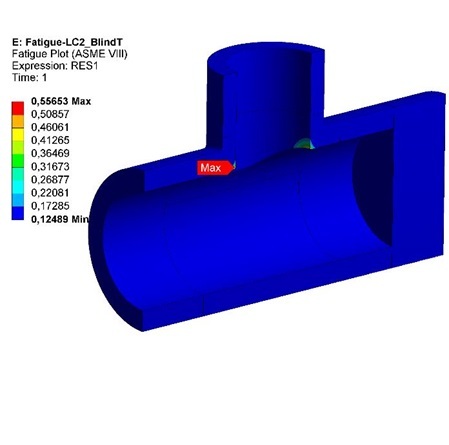 Chapter 5.5.3; Fatigue assessment –elastic stress analysis and equivalent stress can be done by hand, extracting stress results at nodes for each load case. However, in addition to be a time-consuming task with risk of errors, the node location of the maximum damage cannot be known before the actual fatigue damage calculation. The ASME Fatigue app can be used as an efficient post-processing tool to plot the number of cycles to failure, or accumulated damage according to ASME, for a single, or a combination of, load cases. The fatigue curve data tables are implemented and the fatigue curve is directly built using the material properties of the selected bodies.